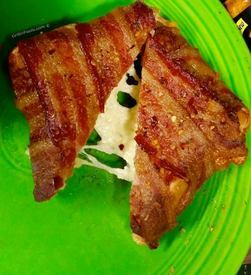 Bacon Wrapped Grilled Cheese? Are you kidding me? No, my friend, I’m not. AND, I’m actually going to grill the grilled cheese, not fry it up in a pan. Well, actually, I’m going to smoke it. That’s right, I took the iconic grilled cheese, added Bacon and THEN infused it with smoke. That’s OK, you can thank me later. Just don’t tell your cardiologist.